Hello, and welcome to Tumbleweed Tidings! Today, it’s all about how to celebrate Valentine’s Day with those you love. Traditionally, Valentine’s Day is a time to go out to a romantic restaurant and share a special meal with those you love. To be honest, that is how we have most often observed the day, as well. But over the past few years, we have noticed an increasing trend for restaurants to use this occasion to come up with elaborate prix fixe menus that can cost an awful lot of money. Case in point; a couple of years ago we were dining at a local upscale Italian restaurant located in a railroad car. It is a place we had often enjoyed, and still would recommend it highly. 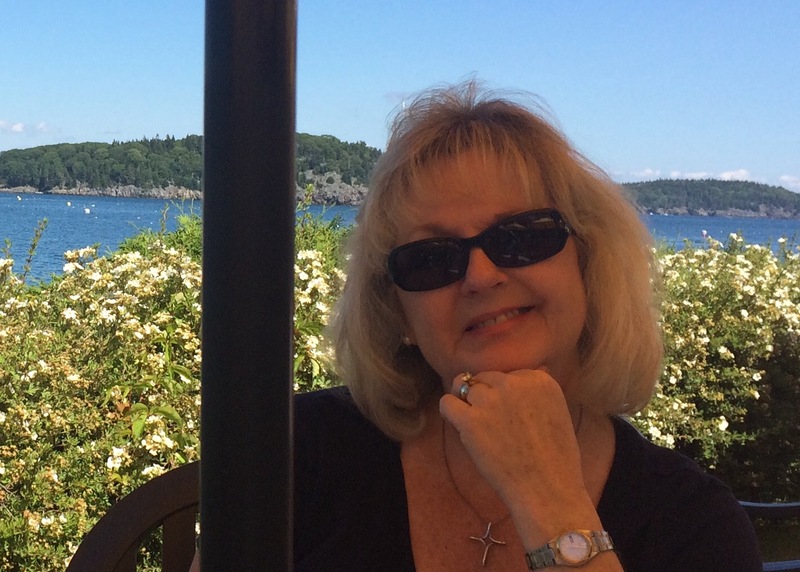 This particular Valentine’s Day, we had made reservations and knew that they were doing a prix fixe menu for $100 per couple, which included three courses with a more limited selection than the normal menu. While enjoying our wine and first course, a young couple arrived and was seated across from us. When the waiter handed them the prix fixe menu, they asked if they could order off of the menu. They were told no, not tonight. We tried not to pay attention to what was going on, but it was hard not too, given the tight quarters of the railroad car. We could see the mental debate that was going on between them, and we half expected them to leave. After some discussion, they decided to stay, but we felt so bad at the dilemma they had been placed in. In retrospect, we should have secretly paid for their dinner, but we didn’t really think of it at the time. I am not anti-Valentine’s Day. To the contrary, I am such a romantic, my husband likes to say it is my favorite holiday (not true…Christmas is, hands down). I am also not anti-restaurant. I grew up in the restaurant business, and still enjoy going out to eat more often than I should. My point is that there is so much pressure to do something wonderful, and expensive, to celebrate Valentine’s Day, that it makes it very hard for those on a limited budget to hit the mark. For those of you with small children, I feel your pain from the days when my three were little and the cost of an evening out escalates when you tack on babysitting. Today, in an effort to give you options for saving money, I am providing a sample prix fixe menu of my own that we will be enjoying this year. 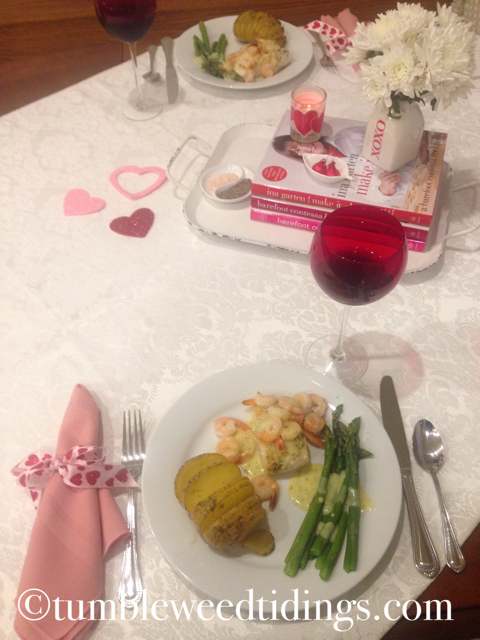 After I go through the courses and the cost, I think you will be amazed at how reasonably you can create a very special Valentine’s Day worthy meal at home that is equal to or better than anything you can get by dining out. I also tried extra hard to make these courses as simple and make-ahead as possible, to go easy on the chef. 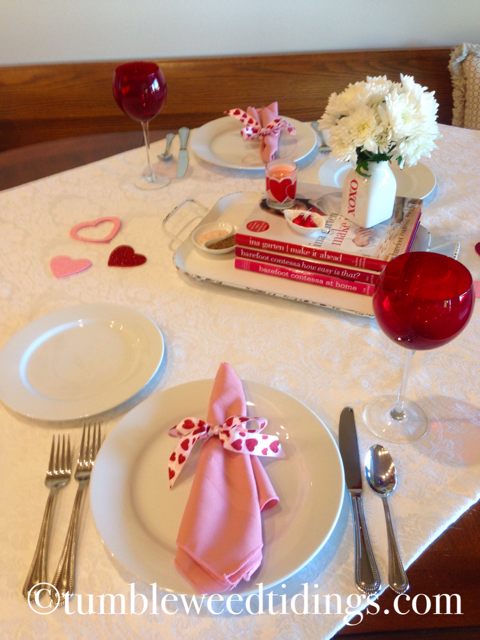 Before we get to the meal, however, let me walk you through the table setting I did to make the dinner really read Valentine’s Day. I took a white damask tablecloth and placed it at an angle on the table. 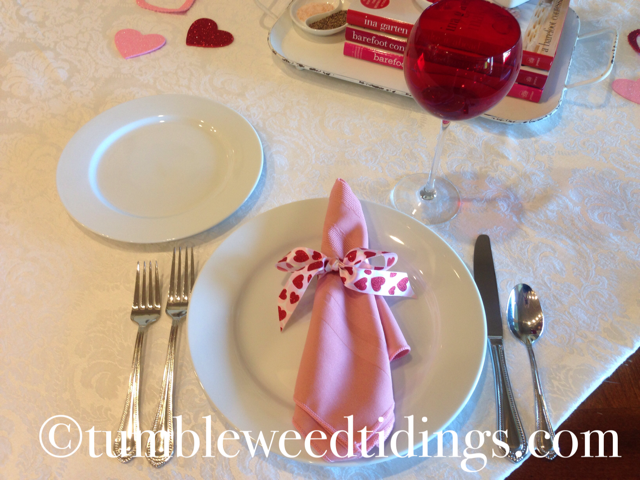 I used pink napkins and tied them with some heart ribbon I had on hand. 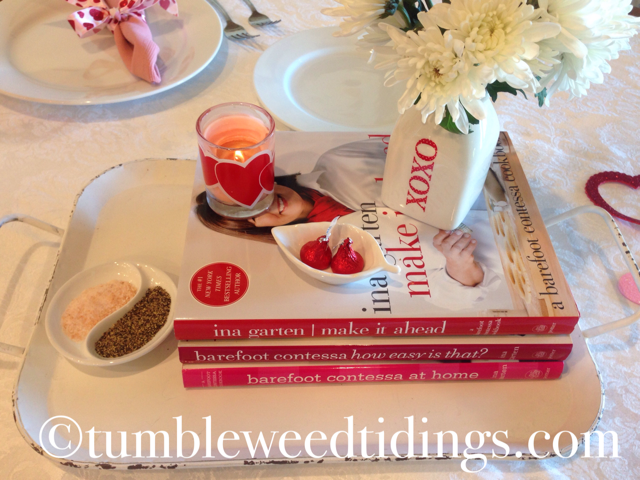 In the middle of the table there is a white metal tray with three Barefoot Contessa cookbooks in pink and red stacked up with a heart candle and an xoxo milk bottle vase filled with white mums. To the side, there is a small white divided dish with pink Himalayan salt (of course!) and pepper. Sprinkled on the table are some glittery hearts I had in my Valentine’s box of decorations. The final touches were white dishware and red wine goblets my mother gave us for Christmas one year. 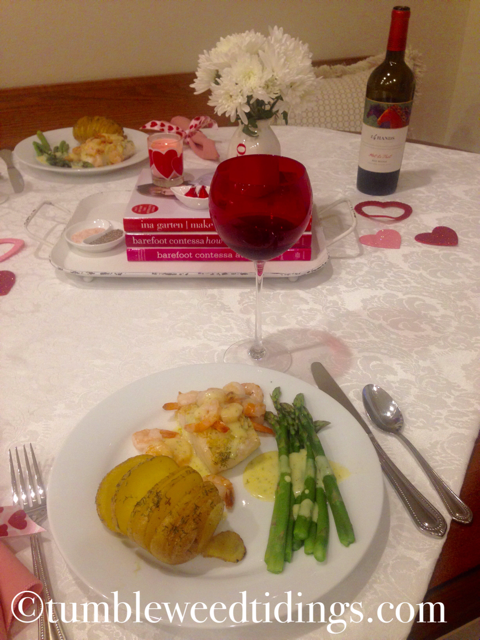 The end result is simple, yet festive…and definitely more special than our normal dinner table! The first course is a baked brie appetizer. 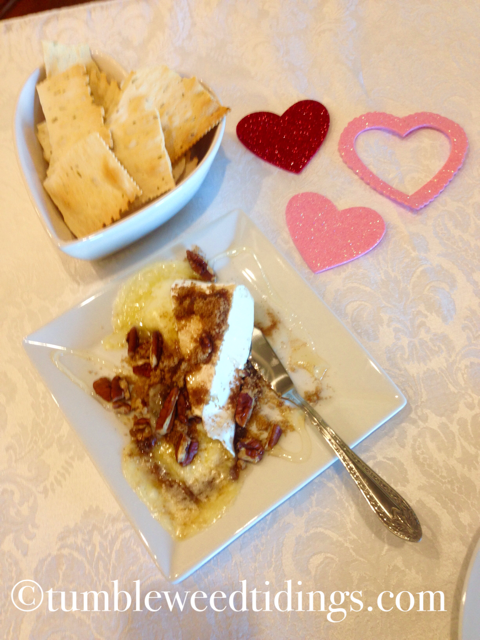 For this easy course, I simply took a small wedge of brie, topped it with a mixture of brown sugar, nutmeg, cinnamon and pecans. I microwaved it for about 40 seconds until bubbly, then topped with a drizzle of honey, and served with Croccatini crackers. Total cost for two servings, $5.00. 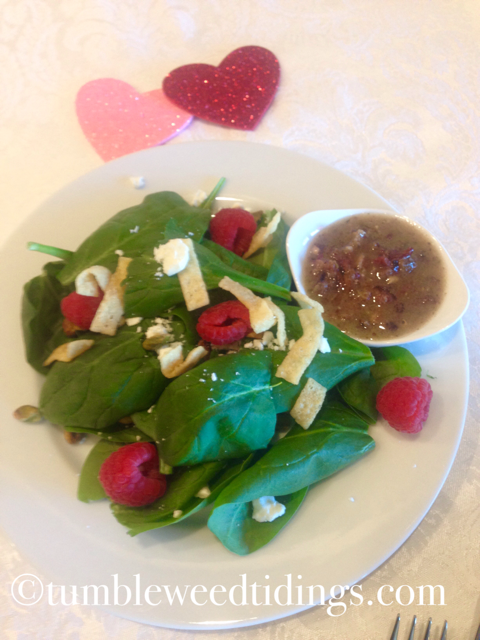 For the salad course, I created a spinach version with feta cheese, chopped pistachio’s, fresh raspberries, and wonton crisps. The salad was served with a warm bacon feta dressing on the side. Total cost for two servings, $5.00. The main course was centered around baked cod, topped with sautéed shrimp and Bernaise sauce, bringing the seafood part of the entrée to $11.11 for two people. 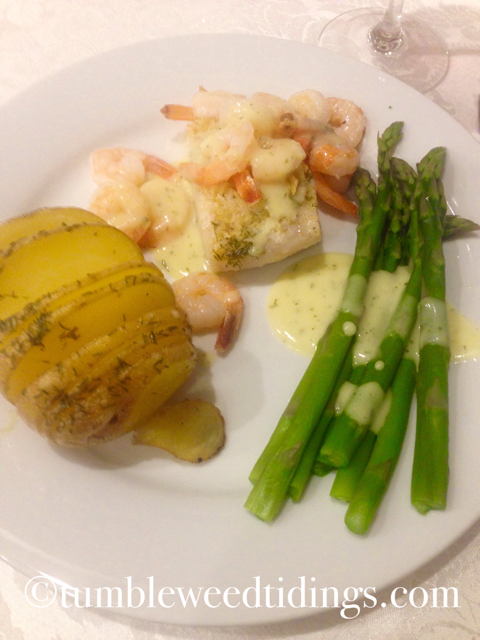 The entrée plate was completed with Hasselbeck potatoes and fresh asparagus, both excellent topped with additional Béarnaise. The asparagus was 3.29, the potatoes .75, the Béarnaise (I use Knorr) was 2.25 and the butter and milk 1.00, for a total of $7.54 for the side dishes for two. For dessert, I chose to use my Cupid Cupcakes, that come in at only $1.00 for two. 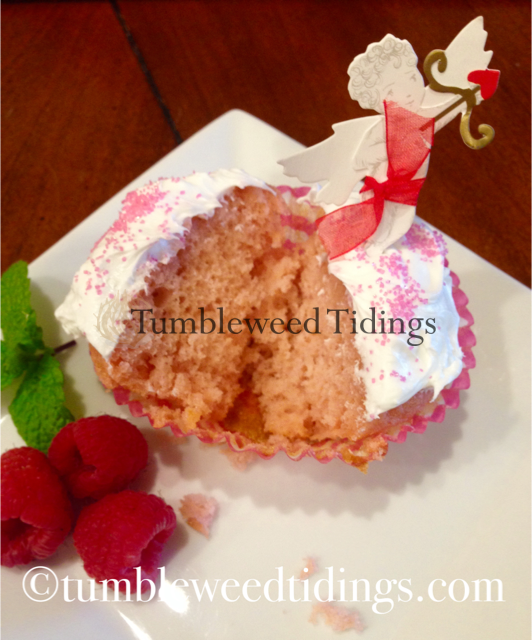 See that preparation here http://tumbleweedtidings.com/2018/02/07/cupid-cupcakes/. You could just as easily make a chocolate mousse or flourless chocolate cake for about the same price per serving. So, if you’ve been doing the math as we go along, this entire dinner for two costs $29.40! Add a nice $10 bottle of wine or champagne, which is not included in the restaurant prix fixe menu prices either, and you still have a very affordable dinner that is reasonably healthy and contains fresh ingredients from all food groups. If you are faced with the dilemma of what to do for Valentine’s Day that won’t break the bank, consider eating in. Even if you find yourself alone this Valentine’s, think about inviting a friend or family member over for a special meal. 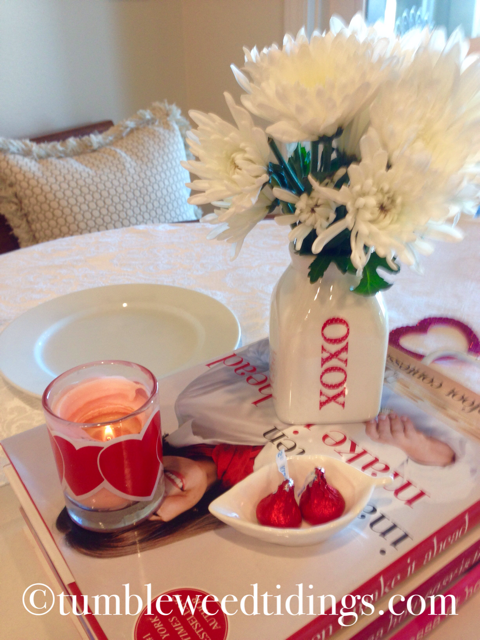 You might be surprised at what a festive table and superior ingredients can do to make staying home feel like the most romantic option of all! This looks just lovely Diane! Happy Valentine’s day! Thank you, Loralee! I hope you have a great day, too! Thank you for the nice comments! I think as we get older, we actually enjoy going out for lunch more than dinner sometimes. The berries gave the salad a little something, and red for Valentine’s. Enjoy whatever you do. I know your husband will love it and you, Patti.